10) Always include lots of CLEAR photos. Blurry ones are a big turn-off. Studies have shown that lots of pictures in auctions are worth a bazillion words. Take pictures from various angles, in good light, showing relative size, etc, and again, never include blurry photos. 9) Give LOTS of info about your product. Also, take advantage of Listia’s ability to add Updates to your Description, should you forget to mention something or end up getting lots of the same question. 8) If you live in a smoke or pet-free household, let it be known. Some people really care about that. My favorite from this week is from one of our user’s auction: “Items come from a smoke free home….I have cats….they don’t smoke either!” Hahahaha! 7) Make sure your Seller’s reputation score is high. Your online reputation is worth everything and will instill confidence in the bidders who are interested. 6) Be extra clear with your shipping options. Ambiguity is your enemy when it comes to having successful auctions. 5) Unless absolutely necessary, try not to “hide” any comments. Bidders will trust you more from your transparency. Besides, any bidder can simply click and see what a seller hid. 4) Try to time your auction to start and end during a reasonable day/time when there are more Listians bidding–that’ll usually lead to higher credits. Don’t have your auction end at 10am east coast time on a weekday, since that would only be 7am on the west coast, and many potential buyers are either rushing off to work or still sleeping. 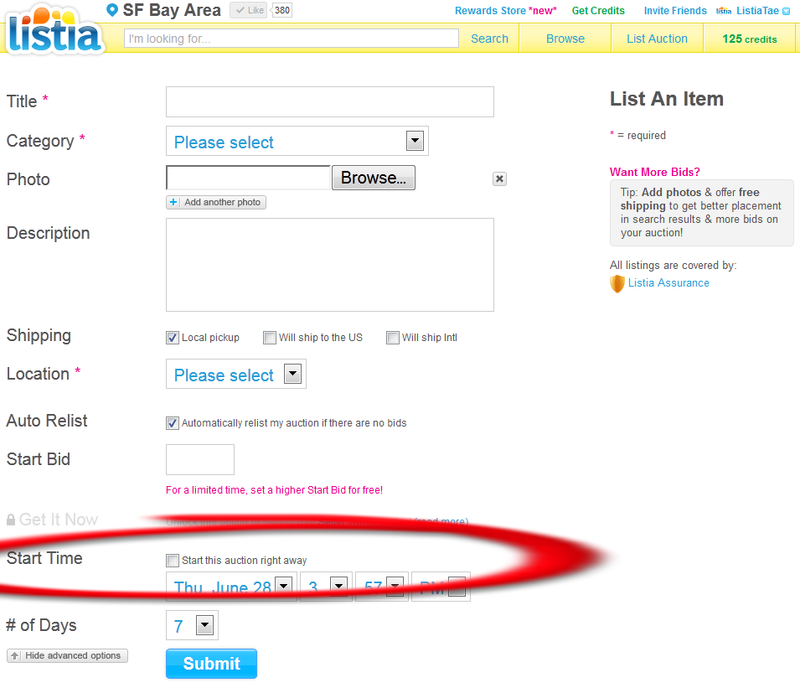 Remember that Listia does allow you to schedule your auctions if that’d be more convenient for you. Start times (thus end times) can be set while creating the auction, under the “Show Advanced Options.” (Requires Listia Perks: http://www.listia.com/account/perks) Click this thumbnail to see exactly where. 3) Try setting your auction as a Premium Auction so that its title is bold in the search results, gets a special icon next to it, and it will get special placement in both the search results and auction pages. The cost varies, depending on the then-current market demand, but it’s usually a good investment. I almost always do mine as Premium with great results. Details can be found here. 2) Offer Free Shipping because you’ll get more bids and better placement in the search results. And you’ll make up the cost with the extra credits you’ll earn. I hope these tips help you get more out of your auctions. Do you have any seller tips of your own that you’ve found to work well for you? Leave us a reply below. Have a suggestion for a future topic? Tell us here too. Coming in the next Newsletter: Shortcuts to blaze through Listia, faster than a lightning bolt! Listia Local – trade with your neighbors! Today we officially launched Listia Local – a set of features that make it easier to trade stuff with your neighbors. We’ve been testing it for a few weeks now, and the response has been so great that we’re releasing Listia Local in four exciting cities. Nothing is better than free stuff…except maybe free stuff in your area! 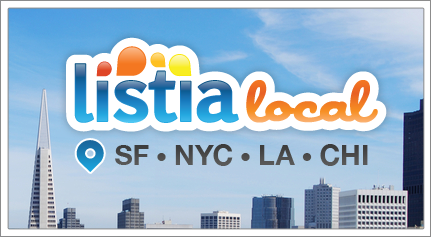 With our new Listia Local filters, you can now browse all listings near you. With the Local Pick Up option, you can get your items from the seller as soon as a listing ends. No more waiting by the mailbox to collect your winnings. Forget about mailing costs. Pick up your winnings locally from a seller, or avoid shipping fees by listing your unwanted stuff for Local Pick Up only. 4) Give and Get Big Things! Now you can earn credits for that big couch no one uses at your house. Or win a new lawnmower from another local Listian. With Local Pick Up, the possibilities are endless! How Do I Get Listia Local? Listia Local is currently available in the following cities, and should be enabled automatically for you if you are in one of those cities. If not, please contact us and we can enable it for you. More cities coming soon!